After emigrating to the United States, John opened his second store in San Francisco, in 1951. John Deleuse’s youngest son, Jeff, joined the family business after receiving a degree in Psychology. Jeff Deleuse then earned a Graduate Gemologist degree with an emphasis on diamonds and gemstones and became a certified appraiser. Jeff’s wife, Janet Deleuse, married into the family after her formal education in Molecular Biology. Janet brought her artistic talent for designing custom jewelry and couture. In 1982, Jeff and Janet Deleuse opened the third Deleuse Jewelers store in Marin County independent of Deleuse Jewelers in San Francisco. Deleuse in Fairfax offers professional services by specializing in gemology and fine diamonds; members of the American Gem Society, American Gem Trade Association and the Contemporary Jewelry Design Group. With attention to detail, quality, design concepts and complex restoration of fine jewelry and watches and insurance appraisals are offered as our services. 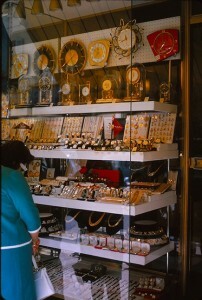 Deleuse Jewelers in Fairfax, California carry on the tradition of customer service that began in Nice in 1945. Showcasing our custom designer fine jewelry that we manufacture exemplifies the creativity and excellent quality that hallmark Deleuse Jewelers. With an increasing portfolio, many of Janet Deleuse’s custom jewelry pieces have been featured in WWD, Town & Country, Robb Report and Lustre magazines. Janet Deleuse is an accepted member into the Contemporary Jewelry Design Group of the U.S. 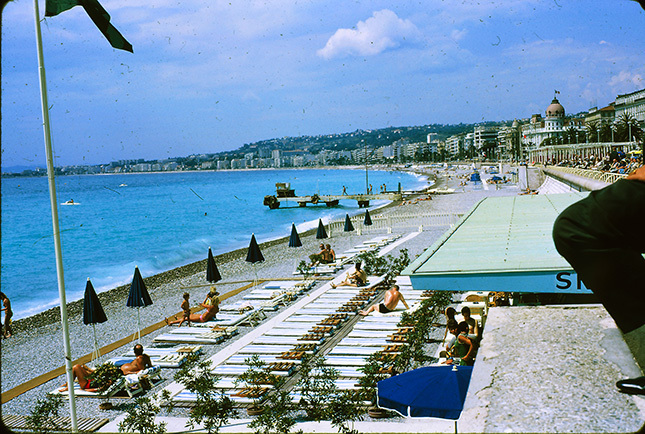 Celebrating 35 years in Marin and 71 years since the first boutique on the Rue De France, Nice, France opened, Janet & Jeff Deleuse owner and operate Deleuse Jewelers in Fairfax, Ca look forward to many more years of continued service. We are thankful for the years of devoted and wonderful customers who have made our success possible. 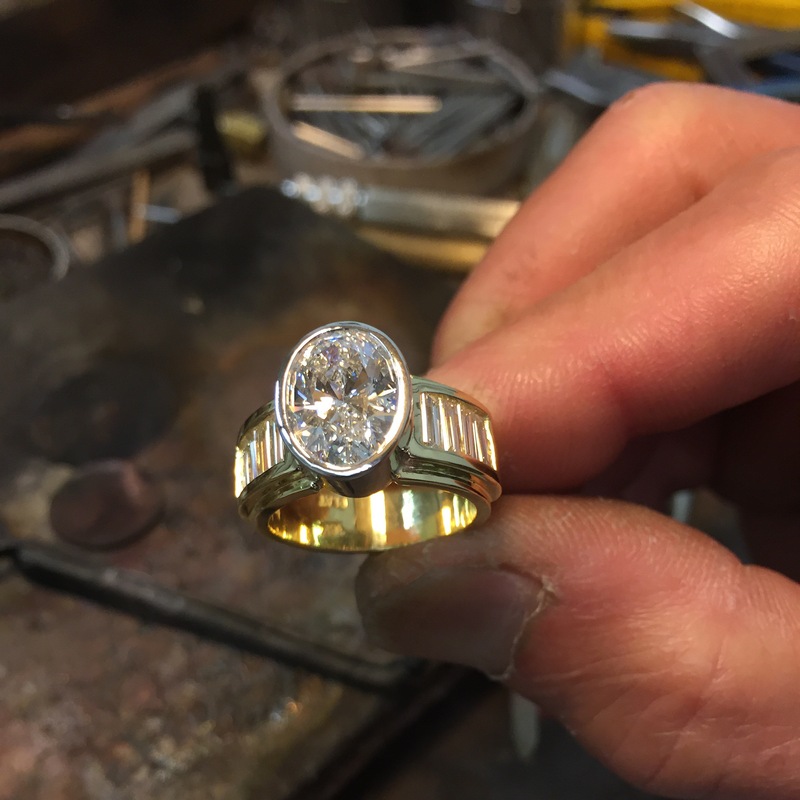 “We hand-fabricate our jewelry the old fashioned way. 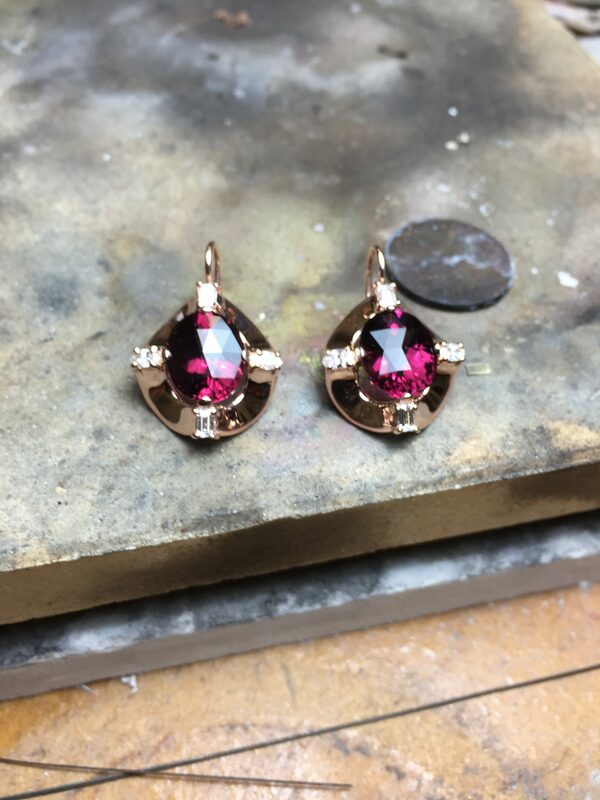 A photo of a custom designed ring and earrings that we made on our work bench.